A spot that longtime Hoboken restaurant Buskers once inhabited now houses one of the best low key spots in the “Sixth Borough.” It’s Marty O’Briens Social Club, and if you’re looking for a laid back night in the neighborhood and a respite from Washington Street, then you’ve come to the right place. As you enter through the solid wood front door you find a bar that appears to have been sitting in this space untouched for decades and not just a few years, which is the reality. The interior of Marty O’Brien’s harkens back to a time of old school class and style when it came to the imbibing of spirits. The owners have recreated a classic spot that boasts a long dark wooden bar and pillars, with warming lighting without being too bright and turn of the century wallpaper. The front bar features plenty of seating and views of HD TVs which seem out of place here, because of the old school vibe. But hey, you’ve got to be able to catch the game right? The rest of Marty O’Brien’s is filled with both high top and regular tables for food service. The flow is perfect as both sections do not overtake each other. A friend and I headed to Marty O’Brien’s on a Tuesday after work. It was nearing seven o’clock and their happy hour was still in full effect. After drinking in the classic aesthetics of the place we learned that the specials consisted of five dollar glasses of wine and while Coors Light and Yuengling were three dollars on draught. As we sipped our cheap pints, patrons entered sitting at the bar long bar. Many of them came in pairs like us, friends catching up for a drink after a long work day. “Marty’s” is perfect for this, as the place is large and the volume on music and games is kept low yet still enjoyable. At the time of our visit college basketball was on, with Guns N’ Roses and other rock playing at a moderate volume. Even though we were only here for a few drinks and to catch up, the place looks decent enough to return for a meal. The dining area is cozy and dimly lit. Each table appears to face the street which is perfect for people watching both day and night. So if you’re tired of the frat house scene on Washington Street, why not take a quick turn off the main drag and head to a friendly spot with great value and a classic pub feel. Hey, if you’re in your thirties, isn’t it time to grow up? Preconceived notion – A restaurant that happens to house a bar. Date – Perfect for a low key first date since you’ll be able to talk to each other, and have enough space to spread out. Dance – I believe there’s a lounge a few blocks up. So, no. Catch up with a friend – Great place to meet up with old friends since the place keeps it super mellow, and has plenty of seating for both drinking and eating. 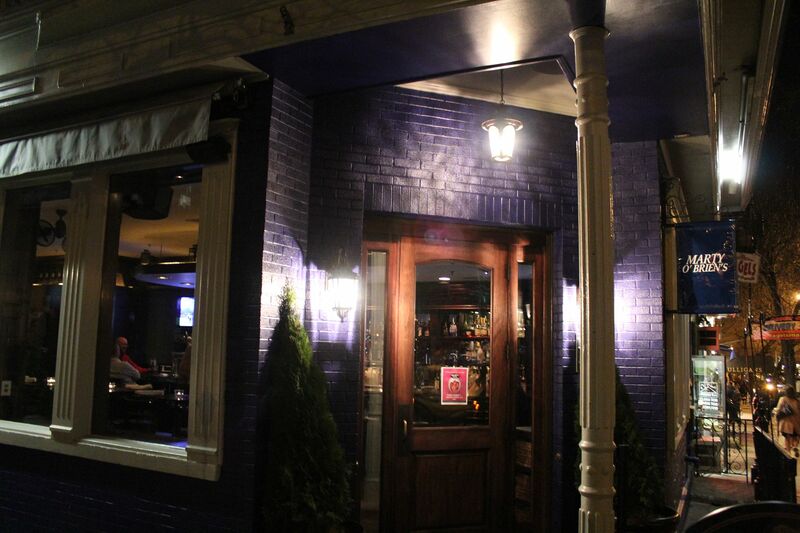 Overall – Marty O’Brien’s has the feel of a classic pub with a super laid back attitude. You can take in the restored old school appearance while sipping on well priced happy hour drinks. The place is especially good for thirty somethings, and those looking for a place to chat, and grab a meal without being overrun by post-college madness… I’ll give it an 8.0.